Where no complete MRA adjustable screen has been produced for your bike (see list of bikes here), this add-on X-Creen XCTA (which simply attaches to your bike's existing original or aftermarket screen) is the perfect alternative solution for the taller, long-distance rider, who wishes to deflect airflow on their bike for the most comfortable ride. The X-Creen air deflector hinge system is produced from a virtually unbreakable Carbon-Fibre Reinforced Polyamide for maximum longevity and durability. 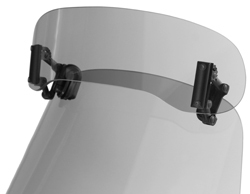 It is supplied with extension arms and Double Hinges to provide an increased range of movement and adjustment - giving a total up/down vertical range of upto + or - 110mm, while still providing the same adjustment of the spoiler angle, regardless of the spoilers height. 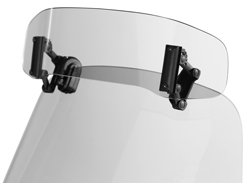 The MRA XCTA Spoiler can either be clamped to the top of your existing windshield using the included fittings, or bolted through your screen for a more permanent solution (parts and drilling template included). 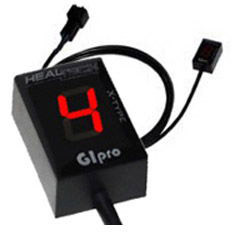 "I fitted it on to the existing screen using the single connection and it worked very well. Made the difference I wanted being a tall rider, just done a 660 mile round trip form London to the Lakes, mostly motorway with a few rural road detours, the screen did its job, no probs even cruising on the motorway at 65/70." "Just thought I would let you know that I fitted the longer hinges to the XCA Screen this afternoon and took the bike out for a trial. I've often heard the expression "like a different bike" and never really believed it. It is true in this case. It really does work. Wind noise and buffeting is minimal. I could take the bike on a long trip without any hesitation and know that I would have an easy ride." "Having now used the new XCA X-creen for the first time on a ten-day 2,000 mile trip around northern Europe, I can very comfortably say that the protection and adjustability it offers made covering several hundreds of miles every other day very easy and not at all fatiguing - even at Autobahn speeds of up tp 250 km/h which couldn't typically be sustained in the UK - when compared with a standard or conventinal screen. Clearly a FireBlade isn't the kind of bike you might typically expect to find this type of spoiler on but, as it can be mounted any bike with a rigid screen/faring arrangement (and can be easliy attached and detached again when not required if the included clamps are used), this may the be the perfect solution for the sportsbike rider who goes on the occasional long distance trip." Giles Harwood. Derbyshire. HPS M.D. X-Creen XCTA add-on is designed to be mounted on motorcycles which have a sufficiently rigid and sturdy standard screen - such as Honda VFR1200, BMW R1200RT & R1100/1150RT to support it effectively. It will generate load around its hinge mounting points and, if affixed to a screen of insufficient strength, cracks - or in extreme circumstances, breakage - could result. Please note MRA/HPS can accept no responsibility or liability for any damage caused to a customers screen as a result of fitting an X-Creen, so please ensure your bike's screen has the required rigidity and strength prior to purchase. Installation simply requires four small holes drilling for permanent attachment to your bike's current screen, or it can be attached and detached  without drilling  with the included Tension Clamp clip-on brackets. X-Creen is a thoroughly researched, tested and highly developed TüV and ABE approved German made product. 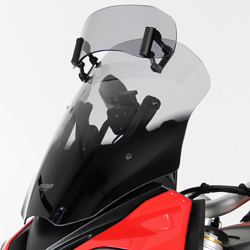 However, X-Creen will always enable significant alteration to airflow, due to variations in bikes' screen heights, riders' height, helmet and clothing worn, no specific guarantees can be provided for its performance for every rider in every installation. For your safety, please ensure before mounting the X-Creen on your bike that when it is in position for your normal field of vision, you will be looking over it (i.e. 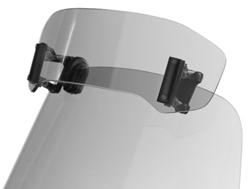 it is normally the case with any motorcycle screen that the rider looks over it and not through it, as it is always the case that through-screen visibility may be impaired during rainy conditions). 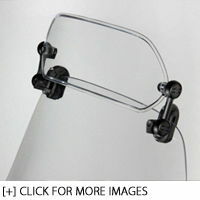 !quote, 56095, 56972, flip, extender, extension, extended, xca, vta, spare, spares, xcreen, xscreen, x-screen, screen, windshield, fairing, spoiler, deflector, visor, vario, flip, aerofoil, aerotrim, aero-trim, aero, trim, deflector, laminar, lip, aprilia, 6.5, 10, 11, 12, 50, 53, 69, 70, 71, 72, 73, 74, 75, 76, 77, 78, 79, 80, 81, 82, 83, 85, 86, 87, 88, 89, 91, 92, 93, 94, 95, 96, 97, 98, 99, 100, 110, 120, 125, 180, 185, 200, 225, 250, 300, 305, 350, 360, 380, 400, 426, 450, 500, 504, 525, 530, 550, 570, 600, 620, 625, 640, 644, 650, 660, 664, 690, 695, 700, 748, 749, 750, 850, 800, 851, 865, 883, 888, 900, 906, 907, 916, 920, 950, 955, 959, 990, 996, 998, 999, 1000, 1050, 1098, 1100, 1200, 1300, 1400, 1800, 1969, 1970, 1971, 1972, 1973, 1974, 1975, 1977, 1978, 1979, 1980, 1981, 1982, 1983, 1984, 1985, 1986, 1987, 1988, 1989, 1991, 1992, 1993, 1994, 1995, 1996, 1997, 1998, 1999, 2000, 2001, 2002, 2003, 2004, 2005, 2006, 2007, 2008, 2009, 2010, 2011, 2012, 2013, 2014, 2015, 2016, 2017, 2018, 2019, 2020, 1000DB5, 1000ds, 1000R, 1000ss, 1050st, 10r, 1100s, 1200c, 1200s, 1200ts, 125ex, 125exc, 125sx, 12r, 200sx, 250et, 250exc, 250r, 250rsb, 2d, 380sx, 3d, 400exc, 400ss, 450sx, 500ie, 500sl, 500ss, 525exc, 525sx, 530exc, 550fc, 600sl, 600ss, 600tl, 625smc, 650gt, 65sx, 660smc, 690sm, 748r, 750c, 750DB1, 750f2, 750k2, 750k6, 750s, 750ss, 800ss, 85sx, 860gt, 860gts, 860mhr, 883r, 900s2, 900sd, 900sl, 900ss, 950sm, 955i, 990smr, 990smt, 996r, 998r, 999s, abs, ace, ad, adiva, adventure, adventurer, aerox, af1, america, AF1 50, af1-125, af1-250, agility, agusta, ala, alazzura, aluzzura, an400, anf125i, antidive, ap50, Aprilia, ar125, ar50, aspencade, atc250r, ate, augusta, b-whizz, b1h, b2, bad, bajaj, bandit, bellaria, benelli, beta, big, bigwheel, bimota, biposta, Biposto, bj250, bking, blog, blu, blue, blues, bmw, bob, bol, bold'or, bonneville, boy, breva, bros, bt1100, buell, bull, bulldog, bultaco, bundy, burgman, bws, c1h, c2, café, cagiva, california, caliper, canyon, Caponord, cat, cb, cb1, cb1000, cb1000r, cb1000sf, cb1100, cb1100rc, cb1100rd, cb1100sf, cb125, cb125t, cb1300, cb1300f, cb1300s, cb1400, cb250n, cb250r, cb350s, cb360, cb400, cb400f, cb400n, cb400sf, cb400t, cb450, cb450dx, cb500, cb500t, cb500v, cb550, cb550f, cb550k, cb600, cb600f, cb650, cb750f, cb750k, cbf1000f, cbf500, cbf600, cbr1000f, cbr1000rr, cbr1100xx, cbr250, cbr400r, cbr400rr, cbr600fs, cbr600fx, cbr600rr, cbr750, cbx1000, cbx250r, cbx550f, cbx750f, ccm, cg125, city, cj250t, classic, clr125, comet, commando, conv, corsa, cr125, cr125r, cr250, cr500, cr80, crf150r, crf230f, crf250r, crf250x, crf450r, crf450x, crf1000l, crm250, cross, cs, ct, custom, cw50, cx500, cx650, cx650e, cyclone, cygnus, d2e, dakar, darmah, davidson, davison, daytona, db1, DB2, DB3, DB4, db5, DB6, DB7, dc, deauville, delux, deluxe, desert, desmosedici, discover, diversion, dl, dl1000, dl650, dn-01, dn01, dna125, dna50, dog, dor, Dorsoduro, douglas, dr, dr-z400sm, dr125, dr125s, dr350s, dr600r, dr600s, dr650rs, dr750s, dragstar, dragster, drz, drz400sm, ds1000, dt, dt125r, dt125s, dual, ducati, duke, dx, dxb, dxd, dylan, dyna, easy, ec200, ec250, ec300, edition, efe, el250, el252, elefant, eliminator, elyseo, en, en450, enduro, enfield, er-5, er-6f, er250, er5, er500, er6f, esd, ese, estrella, et, ETV1000, euro, european, eurosport, evolution, ex, ex305, executive, explorer, extrema, exup, f1, f2, f4s, f6b, f650, f650gs, f6c, f800s, faired, falco, fazer, fc, fes125, fighter, fii, fj1100, fj1200a, fjr1300, flhc, flhr, flhs, flhtc, flhtc-u, flst, flstc, flstf, flstn, fltc, fltc-u, fltri, fly, fmx, fmx650, formula, forza, four, free, fs1e, ft500c, fu, fun, fur, Furano, futura, fuoco, fw, fwdd, fx, fx125, fxd, fxdb, fxdl, fxds-c, fxdwg, fxdx, fxe, fxef, fxlr, fxr, fxr180, fxr180sp, fxrs, fxrs-sp, fxrt, fxsb, fxst, fxstb, fxstc, fxsts, fxstsb, fxwg, fz, fz1, fz1-s, fz400, fz6, gamma, fz750, fz8, fzr, fzr1000, fzr1000r, fzr400, fzr400rr, fzr600r, fzr750r, fzs1000, fzs600, gas, gasgas, genesis, gfr, gfr125, gilera, gl1100a, gl1200a, gl1500j, gl500, gle650, glide, glph, glpv, gn, gold, goldwing, goose, gp100x, gp125, gp125d, gp125n, gp125x, gp800, gpa1, gpx600rc, gpx750r, gpz, gpz1100, gpz1100s, gpz305, gpz500, gpz600r, gpz750, gpz900r, gran, grizzy, gts, gs, gs1000en, gs1000et, gs1000g, gs125e, gs125s, gs250tt, gs400, gs425, gs500e, gs500f, gs550, gs550en, gs550et, gs650, gs650g, gs750b, gs750db, gs850g, gsf, gsf1200, gsf1200sa, gsf1250, gsf1250sa, gsf400, gsf600, gsf650, gsgd, gsm, gsm50, gsr, gsr600, gsx-r1100, gsx-r1300, gsx-r400, gsx-r400rr, gsx-r600, gsx1000s, gsx1100, gsx1100e, gsx1100f, gsx1100g, gsx1100sd, gsx1400, gsx250, gsx250e, gsx400, gsx400e, gsx550ef, gsx550es, gsx600, gsx600fw, gsx750, gsx750e, gsx750f, gsx750sf, gsx750w, gsxr, gsxr1000, gsxr1100, gsxr400, gsxr400rr, gsxr600, gsxr750, gt, gt125, gt185, gt250, gt250r, gt380, gt500, gt550, gt650, gt650r, gt750, gtd, gtr1000, gts, gts1000, gtx, guzzi, gv650, gz125, h1f, half, harley, harley-davidson, harley-davison, hawk, hd, honda, hornet, hugger, husaberg, husqvana, Husqvarna, hyosung, hypermotard, ID, ie, ii, iii, imp, import, indiana, Iniezione, injection, innova, insignia, intruder, italijet, japanese, jonway, jota, jps, k1, k10, k100, k100r, k100rs, k100rt, k1100, k1200, k1200rs, k2, k3, k4, k5, k6, k7, k75, k75-s, k75c, k75s, k8, k9, katana, kawasaki, kb1, kdx200, kh100g, kh125, kh250, kh400, kh500, king, kl650, kle500, klr250, klr600, klv1000, klx110, klx300, klx400, klx450r, klx650, kmx125, kmx450, kr1, kr1s, kr250, kreidler, ks, ks500c, ksr, ktm, kx100, kx125, kx250, kx250f, kx450f, kx500, kx65, kx85, kymco, kz1000, kz1300, kz400, kz650, l0, l1, l2, lambretta, lario, laverda, lawson, lc, lc4, lc8, le, le mans, lemans, light, lightning, limited, linked, lml, lmf, low, lowrider, ls, ls650, lt, ltd, m1000, m1600, m1800r, m2, m400, m600, malaguti, marauder, m620, m750, m800, m900, m900ms4s, machismo, madison, magna, maico, majesty, mana, mans, Mantra, martinique, master, max, mbx125rw, mbx80f, mc19, mc21, mc22, mc28, mean, meanstreak, mhr, Moto, midnight, mille, mirage, mistral, mito, mk1, mk2, mkii, monster, montjuic, morini, motard, motocross, mp3, mt-01, mt-03, mt01, mt03, mtx125rwf, mtx200rwd, multistrada, mv, naked, nc21, nc23, nc24, nc27, nc29, nc30, nc31, nc35, newton, nexus, ng, night, nighthawk, nighttrain, ninja, ninja-650, nord, ns125r, nsr250r, nsr250sp, ntv600-j, ntv600j, ntv650, ntv700v, nx650, nxc, nxc125, ocean, one, pacific, pan, pan-european, pantah, pantheon, paris, paso, password, paul, pc800, pegaso, people, peugeot, piaggio, planet, platina, predator, prima, ps125i, px, quad, quadrunner, quasar, r1, r100, r100cs, r100gs, r100rg, r100rs, r100rt, r100t, r1100gs, r1100r, r1100rs, r1100rt, r1100s, r1150, r1150gs, r1150r, r1150rt, r2, r30, r45, r6, r65, r65ls, r75, r76, r80, r80gs, r80rt, r80st, r87, r90, r90s, racer, racing, raider, raptor, rc, rc51, rc8, rd, rd125, rd125lc, rd200, rd250, rd350, rd400, rd500, ranger, replacing, replica, retro, revere, rf, rf600r, rf900r, rf900rr, rg, rg125f, rg250, rg500, RG80, rga, rgs, rgv, rgv250, rj250, rm250, rm80, rmx, rmx250, rmz, rmz250, rmz450, road, road star, roadstar, RS250, roadster, rossi, rotary, rotax, rrk, rrn, rrsp, rs, rs100, rs125, rs16, rs18, rs50, rs900, rsb, rst, rst1000, rsv, rsv-r, rsv-sp, rsv1000, RSV4, rsvr1000, rt, runner, rvf750r, rx1000, rx50, RXV450, RXV550, rz250, runner, s1, s2, s2r, s3, s4, s4s, sa, sachs, saturno, sauber, savage, SB6, SB7, SB8, sc, scorpion, scrambler, sd, sdr200, sei, sernow, ses125, sfc, sh125i, sh300i, shadow, Shiver, silver, silverwing, single, sixteen, ske, skx, sl1000, SL750, slingshot, slkx, slr650, slr650v, slung, smart, smc, softail, sp, sp1, sp1000, sp1000nt, sp2, sp3, spada, speed, speed fight, speedfight, speedmaster, spirit, sport, sports, sportster, spider, springer, sprint, sps, sr250, sr50, sr500, srv250, srv850, srx600, ss, ss50, st, st1100, st1300, st1300x, stx1300, st2, st3, st4, standard, star, strada, streak, street, streetbob, strike, super, super tenere, S&T, motors, superbike, supercity, superdream, superduke, superfour, superglide, superlight, Supermono, supermotard, supermoto, supersport, suzuki, sv, sv650, sv650s, sxv, sxv450, sxv550, sz, szr660, t-max, t100, t140d, t140v, t3, t4, t5, t509, t595, targa, tbird, tc, tc570, td, tdm, tdm850, tdm900, tdr125, tdr250, tema, tenere, Tesi, Tesi2D, Tesi3D, thruxton, thunder, thunderace, thunderbird, thundercat, tiger, tl, tl1000, tl1000r, tl1000s, tm, tnt, tour, tourer, tr, tr1, trail, train, transalp, trial, Tuono, tricolore, triple, triumph, trophy, trx, trx850, ts125, tss, tsx, tt, tt-r250, tt600, tu250, Tuareg, tuatara, v-strom, turbo, twin, twindisc, tx, tx350e, tz125, tz250, van van, tzr, tzr125, unfaired, us, V-Due, v-max, v-rod, v-tec, v35, V4R, v50, v65, valkyrie, valve, vanvan, varadero, vectrix, vx-1, vx1, vdue, venture, versys, vespa, vf1000fe, vf1000fr, vf1100, vf400f, vf500f, vf700c, vf750c, vf750f, vfr400r, vfr750f, vfr800f, vl125, vl1500, vmax, vn1500, vn1600, vn2000, vn800, vn900, volty, vrod, vs, vs1600, vs600, vs750, vs800, vstrom, vt1100, vt250f, vt500e, vt750c, vt750dc, vt800, vtec, vtr1000, vtr1000f, vtr250, wind, vtx1300, vtx1800, voxan, vulcan, vx800, vz1600, vz800, vz850, w650, warrior, west, wheel, white, whizz, wide, wideglide, wildstar, wing, wr, wr250, wr250r, wr250x, wr360, wr426f, wr450f, x-city, x-max, x1, x7, x8, x9, x11, x4, xb12r, xb12s, xb9sx, xbr500f, xcity, xevo, xj550, xj600, xj650, xj750, xj900, xjr1200, xjr1300, xjr400, xl, xl1000v, xl1200c, xl1200s, xl125rf, xl125rt, xl125v, xl53c, xl600, xl600r, xl600v, xl650v, xl700v, xlh, xls, xls1000, xlv1000, xn85, xp500, xr, xr125l, xr250r, xr400r, xr400rv, xr650, xrv750, xs, xs1100, xs1100s, xs250s, xs400se, xs500c, xs650, xs650c, xs650e, xs750, xs750se, xs850, xt, xt125, xt125r, xt225, xt250, xt350, xt500, xt600, xt600z, xt660r, xt660x, xt660z, xtc125, xv1000, xv1100, xv125s, xv1600, xv1700, xv1900, xv1900a, xv750se, xv920, xvs1100, xvs650a, xvz12td, xz550, xz550s, yamaha, YB11, YB4, YB5, YB6, YB7, YB8, YB9, ybr, ybr125, yp125r, yp250, ypvs, yz125, yz250, yz250f, yz426, yz450f, yz85, yzf-r1, yzf-r125, yzf-r6, yzf-r7, yzf1000, yzf250, yzf600, yzf750r, yzfr, yzfr125, yzfr6, yzfr7, z1000, z1000k, z1300, z1a, z1b, z1r, z250, z250t, z400, z400f, z440, z450, z500, z550, z650, z750, z750b, z750ct, z750e, z750s, z900, zephyr, zg1000, zg1300, zip, zl1000, zl1100, zl600, zr-7, zr-7s, zr400, zr50, zr550, zr7, zr750, zr7s, zrx1100, zrx1200r, zrx1200s, zx-10r, zx-12r, zx-6r, zx-7r, zx-9r, zx10, zx1000, zx10r, zx1200, zx12r, zx14, zx6r, zx6rr, zx7r, zx7rr, zx9r, zxr, zxr400, zxr750r, zzr, zzr1100, zzr1200, zzr1400, zzr250, zzr400, zzr600, peugeot, city, star, citystar, elystar, geo, rs, style, geopolis, satelis, ! ...standard tiger sport screen is to weak at full height. Great quality item, prompt delivery. Many thanks.